Germany had long been aware of its failure to win the World Championship and, if Stefan Bellof had not been killed in a sports car race in 1985, it could all have been very different. Exciting is a description that does not really do justice to Stefan's driving: it was electrifying. He was, in short, a joy to watch - on the ragged edge of control where others would long previously have lost it. Fresh out of karting, he won the German Formula Ford Championship, vaulted to Formula Three for 1981 and was third overall. 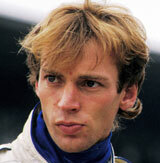 Moving up to Formula Two in 1982, he drove with great success for the Maurer team, winning the first two races. However, results tailed off, with retirements blunting his achievement. So a second Formula Two season became essential, dovetailed with sports car races for the works Porsche team. He made it to Formula One in 1984 with Tyrrell and was challenging for victory at Monaco before heavy rain stopped play when he was third, thwarting both him and Ayrton Senna as they closed on Alain Prost. However, the Tyrrell team was found to have committed a technical irregularity and all his points were removed for the 1984 season. At least Stefan was able to enjoy winning six times for Porsche en route to claiming the world title. For 1985 he found the Tyrrell to be less competitive, and had only a fourth and a sixth to his name when he overstepped the mark in a sports car race at Spa, failing in a crazy attempt to overtake in the daunting Eau Rouge corner. He died instantly.